Juventus set a new record in Europe's leading 10 top flights by finishing the season with 102 points after a comfortable win against Cagliari. Andrea Pirlo's free-kick went in off keeper Marco Silvestri before Fernando Llorente poked in from close range. 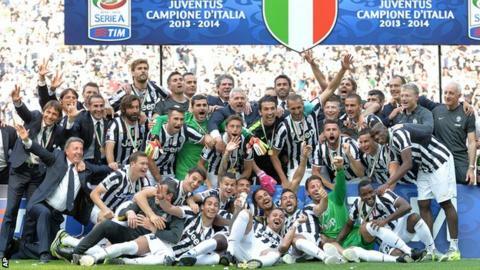 Claudio Marchisio rifled in a third to wrap up Juventus' day of celebration. Juve, who finish 17 points ahead of second-placed Roma, end the season with 19 wins from 19 home league games and 33 league wins in total. Manager Antonio Conte has yet to commit his future to the club and he was given a standing ovation by the home fans when he emerged for the trophy presentation. A huge banner had also been unveiled at the start of the second half featuring Conte's face and the words "without you we won't go far because you are the best and have Juve in your heart". Match ends, Juventus 3, Cagliari 0. Second Half ends, Juventus 3, Cagliari 0. Offside, Juventus. Simone Pepe tries a through ball, but Carlos Tévez is caught offside. Foul by Luca Rossettini (Cagliari). Simone Pepe (Juventus) wins a free kick in the defensive half. Substitution, Cagliari. Antonio Loi replaces Víctor Ibarbo. Corner, Cagliari. Conceded by Leonardo Bonucci. Attempt blocked. Agim Ibraimi (Cagliari) left footed shot from outside the box is blocked. Assisted by Mauricio Pinilla. Offside, Juventus. Kwadwo Asamoah tries a through ball, but Pablo Daniel Osvaldo is caught offside. Substitution, Juventus. Simone Pepe replaces Andrea Pirlo. Offside, Juventus. Stephan Lichtsteiner tries a through ball, but Pablo Daniel Osvaldo is caught offside. Attempt blocked. Daniele Dessena (Cagliari) right footed shot from outside the box is blocked. Assisted by Agim Ibraimi. Foul by Víctor Ibarbo (Cagliari). Danilo Avelar (Cagliari) wins a free kick on the left wing. Daniele Dessena (Cagliari) wins a free kick in the defensive half. Corner, Juventus. Conceded by Alessandro Bastrini. Attempt blocked. Pablo Daniel Osvaldo (Juventus) right footed shot from the centre of the box is blocked. Assisted by Paul Pogba. Attempt missed. Agim Ibraimi (Cagliari) left footed shot from outside the box is close, but misses to the right. Assisted by Víctor Ibarbo. Substitution, Cagliari. Agim Ibraimi replaces Andrea Cossu. Attempt saved. Paul Pogba (Juventus) left footed shot from the right side of the box is saved in the bottom right corner. Assisted by Martín Cáceres. Offside, Juventus. Claudio Marchisio tries a through ball, but Carlos Tévez is caught offside. Attempt missed. Alessandro Bastrini (Cagliari) left footed shot from outside the box is high and wide to the left. Gabriele Perico (Cagliari) wins a free kick in the defensive half. Substitution, Juventus. Rubinho replaces Gianluigi Buffon. Víctor Ibarbo (Cagliari) wins a free kick on the left wing. Foul by Andrea Tabanelli (Cagliari). Corner, Juventus. Conceded by Danilo Avelar. Hand ball by Víctor Ibarbo (Cagliari).